For America's most powerful media companies, the battle for dominance may be best fought overseas. Comcast and Disney are both trying to buy Sky, which operates pay-TV services in the UK and other regional markets like Germany and Italy. The bidding war has been brewing for months. Both companies are trying to diversify as a way of bolstering their influence in an industry that has been upended by Netflix (NFLX), Amazon (AMZN) and other tech companies. "Between Fox and Sky, there's a dramatic amount of overseas assets," said Rich Greenfield, a media analyst at BTIG Research. Comcast is still largely a domestic company, which Greenfield believes is influencing its desire to expand elsewhere. Disney also sees the appeal. 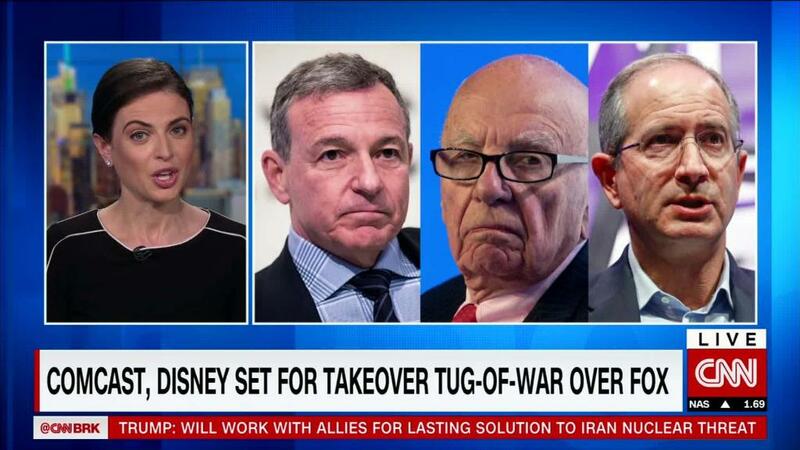 Last year, CEO Bob Iger called Sky a "a real crown jewel" in an interview on Bloomberg TV, and complemented the broadcaster's "value proposition to their consumers." International success has long been on the minds of American media companies. In a call with investors Tuesday, Discovery CEO David Zaslav used the Sky battle to tout his companies' own global footprint. "We've been hanging out outside the US for the last 25 years," Zaslav said, citing the company's reach in Europe, where it has a deal to broadcast the Olympics. "And so when we see people fighting over Sky, that looks to us like, 'Hey, we've been there.'" Newer services are also taking notice. Netflix, for example, has been investing heavily in its own worldwide expansion, and expects to have about 80 foreign-language shows this year. Disney's (DIS) role in buying Sky is unfolding by proxy through 21st Century Fox (FOXA), which agreed to sell most of its assets — including any Sky stake — to the former last year. Fox already owns 39% of Sky and struck a deal for the rest in late 2016. But Comcast (CMCSA)seems intent on crashing that arrangement. Last month, it formalized its own bid for a majority stake in Sky as a challenge to Fox, leaving the broadcaster's fate uncertain. Now the NBCUniversal owner wants to up the ante. News broke earlier this week that Comcast is talking to investment banks about usurping the Disney-Fox deal, too. If it prevails, the company could walk away with all of Sky, along with a bunch of Fox film and TV assets. Fueling the fire, Iger and Comcast CEO Brian Roberts deeply dislike one another because of a personal feud that dates back to Comcast's hostile takeover attempt of Disney in 2004, sources familiar with their relationship tell CNNMoney. The battle for Fox and Sky could be unpredictable and irrational. Some have questioned whether Disney would be willing to relinquish Sky. The Hollywood Reporter on Wednesday reported that Disney may let Comcast have the company so it can keep the Fox assets. Greenfield, however, called Sky "critical" to Disney's growth. "Disney's keen interest in Sky supports our view that the only way Comcast can take control of Sky is to acquire all of Fox," he wrote on his BTIG Research blog Wednesday. The Comcast-Disney fight, meanwhile, may take some time to play out. According to a source involved in the deliberations, Comcast will probably only move forward with a Fox bid if AT&T is allowed to buy Time Warner, CNN's parent company. The Justice Department has sued to block AT&T's (T) purchase of Time Warner (TWX), and a judge is currently working on a ruling in the case. -- CNNMoney's Brian Stelter and Dylan Byers contributed to this report.